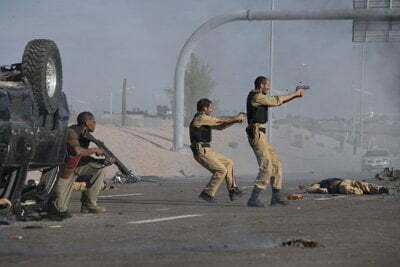 After the bombing of an American compound in Saudi Arabia leaves over a hundred innocent civilians dead, the United States is determined to find the radical Muslims responsible. However, since the Saudis are supposedly allies, a diplomatic solution is in order as opposed to a military intervention. 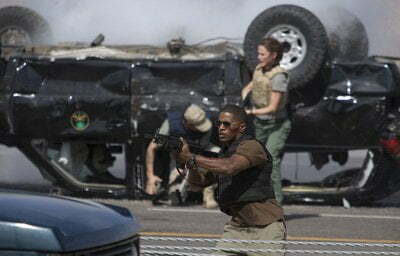 But with signs that the negotiations are bogging down among the bureaucrats, the FBI opts to intervene via a top secret operation headed by Agent Ronald Fleury (Jamie Foxx) who has a special interest in the assignment. For, among those who perished in the attack was his best friend and colleague, Agent Francis Manner (Kyle Chandler). With word that he’ll have only five days to infiltrate and bring down the terrorist cell, Fleury quickly assembles an elite team of intrepid agency renegades, each with a different skill needed for this dangerous mission to the Middle East. The crew of commandos is comprised of intelligence analyst Adam Leavitt (Justin Bateman), demolitions expert Grant Sykes (Chris Cooper) and forensic examiner Janet Mayes (Jennifer Garner). Upon their arrival in Riyadh, Fleury and company are debriefed by the Saudi in charge, Colonel Faris Al-Ghazi (Ashraf Barhom), who soon vents his frustration with the royal family for discouraging him from mounting a legitimate investigation thusfar. Furthermore, it becomes apparent that even the U.S. envoy Damon Schmidt (Jeremy Piven) would prefer to stage a phony raid for a P.R. photo op than to risk destabilizing the region with an actual assault on the jihadist stronghold. Fortunately, Faris is an honorable soul who cares more about fundamental notions of justice than on a reflexive loyalty based on religion. Thus, he’s willing to incur the ire of his superiors to help the fearless FBI foursome negotiate its way around a maze of obstacles ranging from unreliable informants to political adversaries to the city’s terrain to the searing heat. 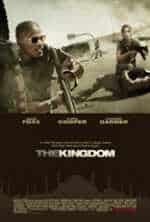 Directed by Peter Berg, The Kingdom is a combination flick, part psychological thriller, part pyrotechnic spectacular, which works somehow despite considerable conceptual flaws. The first three-quarters of the movie unfolds like a cat-and-mouse caper, even though it’s riddled with preposterous inaccuracies such as the sight of Janet walking around Saudi Arabia unnoticed in Western clothes, when women over there are required by law to be covered from head to toe in basic black, 24/7. So long as one is willing to suspend disbelief in favor of a patriotic escape, the film furnishes a satisfying chase worth watching which inexorably builds to a spectacular showdown reminiscent of Black Hawk Down, except the cowboys wearing the white hats win. Sweet revenge in the desert.